So im about a year in to playing and can definitely tell the difference a bow makes. Ive got a pernambuco bow I got for about $170 but it bounces and I feel uncomfortable playing near the frog. I know most of it is technique, but would it be beneficial to upgrade to a nicer bow to ease my technique or just smash through until I get my technique under control before upgrading? Well, if there's a shop near you where you could try some bows or you have some friends who play that might let you try theirs, it should be pretty easy to figure out if it is your technique or the bow. @risk. 99.9% of the time it's not the bow. Everyone goes through the "bouncy bow" syndrome in the beginning. Sounds like you already have a decent bow. Give it time, it will be gone in time. My suggestion would be for you to get a FM carbon fiber bow. It will solve your problem of not knowing. The CF bow is light weight and balanced nicely. My bouncing went away as soon as the CF bow arrived. Of course I can make it bounce just by not paying attention, LOL. But the CF bow took away my guessing about whether it was the bow or my technique and that alone was worth the price. 1) the condition of your frog, tip and screw that streches the bow hair. Do all these work? 2)Is your frog closer to the thumbrest rather than the end of the bow? A frog being too far away, used to make my bows quite unstable and mad. 4) Is the bow stick straight when you look it from above? This could also be caused by missing (many) bow hair. I would not mind a bouncy bow, that bounces to the up-and-down direction. However it would be serious if it would move towards the fingerboard or the bridge by itself. After all, remember that bows should bounce, especially when they are "asked" to do so. Not all bows suit all players, but I suggest that you stay clear from really stiff bows that do not bounce at all. When I was a small kid and a beginner, such stuff were reeeeally stable. But they for sure did not allow me to produce a decent staccato or spiccato. So I tried out several bows at a luthiers. I prefer my bow to every bow I tried that is cheaper, and many that are more expensive. There were a few that didnt quite bounce as much for me but I did notice I liked the way it felt while holding it. Not necessarily the balance, but general feel. I guess im asking if getting a bow that "feels" better would help me hash out my terrible bow technique, I know its mostly me and not my bow. 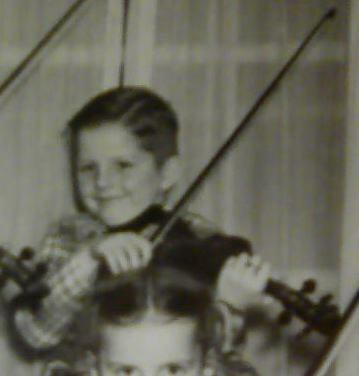 None of the bows ive tried yet "speak" to me like this violin and the "holy cow" violin I tried that I couldnt afford.....yet. @risk: Again, a bow is not a magic wand, it's just something you'll have to overcome. Be patient, it's happened to all of us, then presto the bounce is gone. @Fiddlestix cmon now, where are you hiding the genie?!? I have 3 very expensive bows but I find myself using my own Fiddlerman Carbon Fiber bow. Mostly cause I don't want to rehair my fine bows. I would keep using the bow you have until the bounce is gone, no need to spend money if you don't have to. Then if you feel you need to upgrade, by all means do it. To tell the truth, I like the FM Pernambuco bow better than I did with the FM/CF bow I once had. I'm telling you, the bounce will go away and when it does, chances are you'll not even realize it's gone. Ok, so today at my lesson we were going over amazing grace as fiddlerman posted with double stops. It sounded like a cat was getting squished, has ever since ive tried playing it, I nstructor has no idea so I hand her my violin and it does it for her too, she says must be violin, so I have her try my violin with her bow and it stopped. Luckily the shop I got it from is willing to trade it back in. I love it when a mystery is solved. Haha! Im going to post a vid of it. Its kinda funny now that I know the dead cat screech wasn't me. Now the bounce will be a diff story. So I'm guessing its the amount/type of rosin on your bow or the condition of the hair... since she can not duplicate it on your instrument with HER bow. @cdennyb oh? The hair is good. What shoukd I be looking for to determine if it is a type or quantity of rosin problem? Check that it's 'sticky' a little, make sure you don't get that sound playing your violin with HER bow and that would narrow down the reason a lot. Ya its sticky. . Ill try that and report back. Contrary to how it sounds I havent made up my mind that I want or need a new one. Just thought it might help me out. Thanks for your replies, helps a ton!! FYI, you can safely clean off the current rosin with a cloth wetted with isopropanol (rubbing alcohol). Ask your teacher which rosin she uses. I bet that is a huge relief.